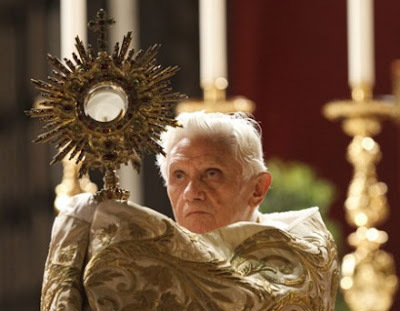 The Herald has published an AP article today on what Pope Benedict XVI said to the Eucharistic Congress recently; an article which translates spiritual language into the mundane and thus misses the significance of what has been said. While there have been demands from Irish rank-and-file Catholics, including those who suffered abuse from clergy, for accountability from church hierarchy, Benedict's answer as to why the abuse occurred dealt with the spiritual and not the administrative level. "How are we to explain the fact that people who regularly received the Lord's body and confessed their sins in the sacrament of Penance have offended in this way?" the pope, referring to the abusive clergy. He added that "evidently their Christianity was no longer nourished by joyful encounter with Jesus Christ. It had become merely a matter of habit." I think I understand what Pope Benedict is saying. It's a way of thinking whereby some of what one does is not considered sinful and thus omitted from Confession (the Sacrament of Penance). Only problem with this is that omitting a grave sin renders your Confession ineffective, which can only be remedied by Confession the omission and all the grave sins since the first omission. Any person who commits grave sins and is not forgiven through Confession and continues on to receive the Lord's body is guilty of his own condemnation, compounded by each unworthy Communion. It is a terrible place to be, and makes it more and more difficult to overcome the sins one commits as time goes on. I would would say that the Holy Father said that it was a 'great mystery', because this holding back of that first grave sin that leads to all the others would be somewhat unimaginable for him. Now, don't think that I am referring to sexual abuse of a child as that first grave sin from which everything else springs. No, it always starts in the thoughts, through engaging with inappropriate desires, rather than being tempted and then turning those desires away. That would have been the first grave sin that needed to be confessed. A priest would know this, so this is where the mystery would lie. A priest would also recognise the danger, so then why would he not confess at this point, thus gaining mastery over the temptation? I too raise my voice, I beseech, beg and implore that no one draw near to this sacred table with a sullied and corrupt conscience. Such an act, in fact, can never be called "communion," not even were we to touch the Lord's body a thousand times over, but "condemnation," "torment" and "increase of punishment"
So, from desires and thoughts to action, and ever increasing denial that would lead to more and more to the abyss. There's nothing worse than a Catholic gone bad. The Discipline Regarding the Denial of Holy Communion to Those Obstinately Persevering in Manifest Grave Sin - discusses the need to be in a worthy state in order to receive Holy Communion.